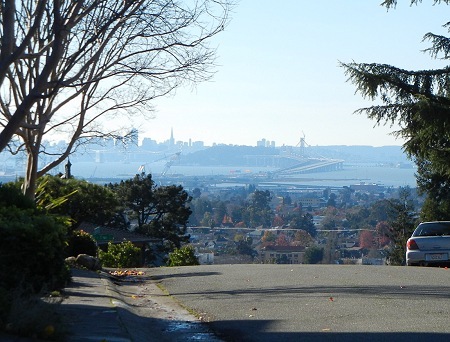 Walk number 30 in Charles Fleming’s Secret Stairs East Bay, which he refers to as upper Rockridge west, goes from the Rockridge BART station over the Franciscan bedrock hills of upper Rockridge. The views are great, and there are a few rocks as well. Here’s the route map (click it for a larger version). And here’s the route shown on the geologic map. It goes counterclockwise. 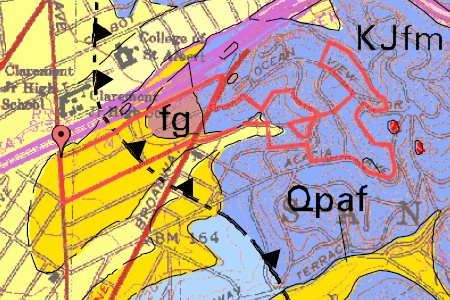 The orange Qpaf is old alluvial terrace, KJfm is Franciscan melange, and fg is Franciscan greenstone (you might see a little of that near the end if you’re vigilant). Melange is lumpy stuff, as I’ve said before, mostly shale with knockers of harder rocks here and there. And here’s the topography, with the sites of the following photos marked on it. 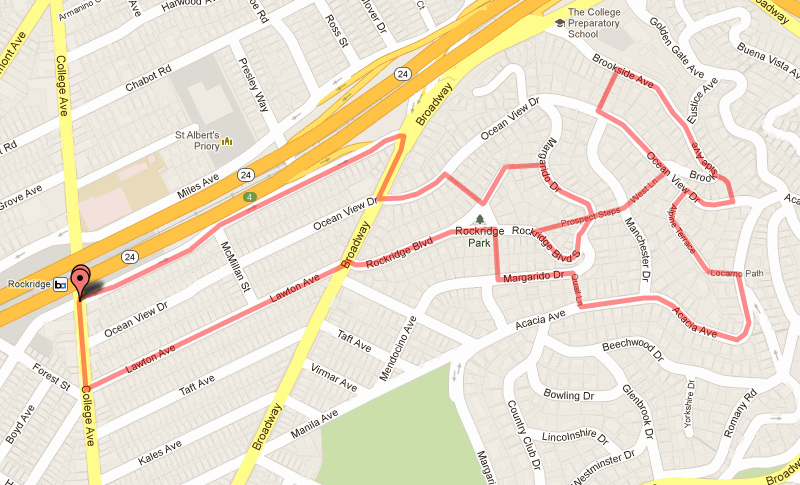 The walk basically circles the bowl cradling little Rockridge Park with a couple of forays over its rim. The new parklet at the BART station is nice. Naturally the boulders were sourced elsewhere. 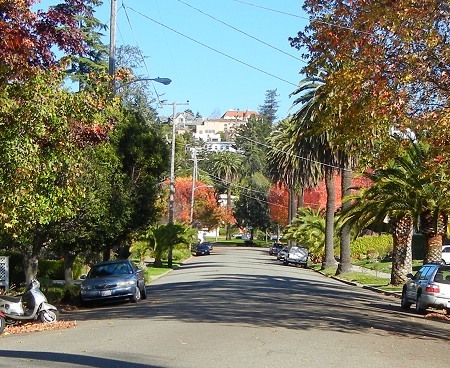 The first part of the walk is housewatching until you cross Broadway to Rockridge Boulevard, where you face the hills through an allee of big palms. We’re at the 200-foot contour and looking at homes above 400 feet. It’s steep land, but not as bad as the high hills. Once you get up into the hills, you get views in all directions. Pick a good clear day to do this walk. 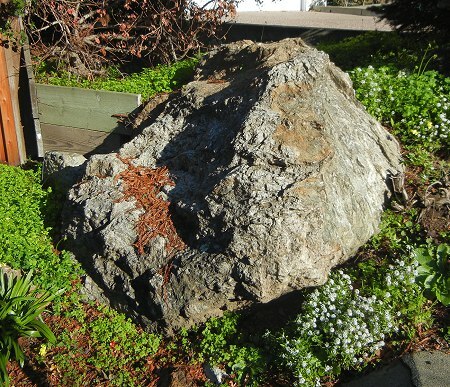 As you go along Acacia Avenue, keep an eye out for Cactus Rock, reputed to be The Rock that gave Rockridge its name. I’m not fully sure that’s true, but I’m at a dead end in that quest at the moment. The high point of the walk is on Alpine Terrace, at about 450 feet. It has several empty lots left over from the 1991 Hills Fire. This one always gives me a qualm. 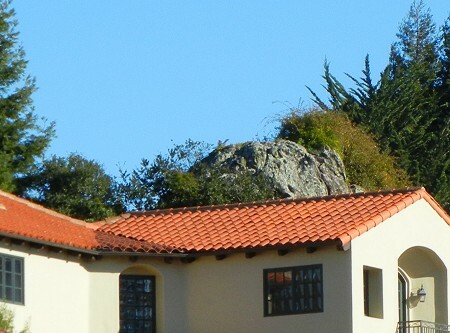 The top of the elaborate Brookside Steps features this gnarly boulder, which I’ve featured here before. This is what they should have used down at the BART station. As you wander over to the north end of the loop, enjoy the views that way. 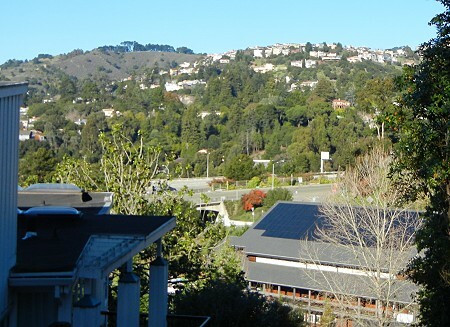 Here we have the chaparral of Claremont Canyon, the homes of the Claremont Hills neighborhood, and in front the solar roof of the College Prep School, which I was pleased to see produced a finalist in the Intel Science Talent Search this year. That is a huge brag for Oakland. 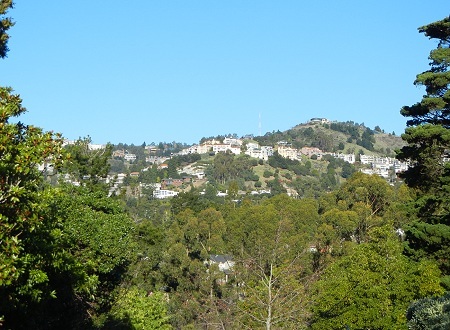 Here’s a view of upper Hiller Highlands, including one of the two big round houses up there. This is the lower one, at the end of Devon Court. 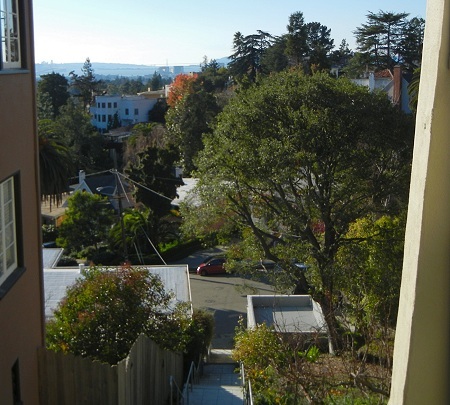 And here’s the view east toward the eastern, higher crest of upper Rockridge studded with homes. A glimpse of uppermost Broadway Terrace is at left. All the distant points in these last three photos are across the Hayward fault. The long, sturdy stairway was constructed by Schnoor & Son. By my reckoning, that makes this 100 years old. 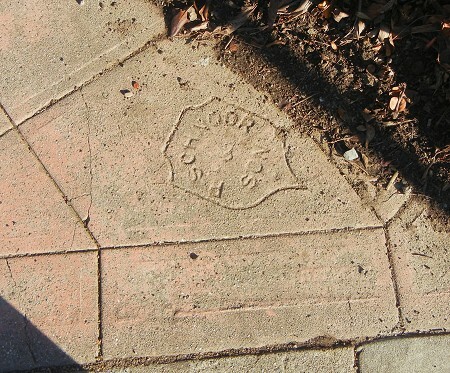 Other sidewalk stamps up here date from 1913. 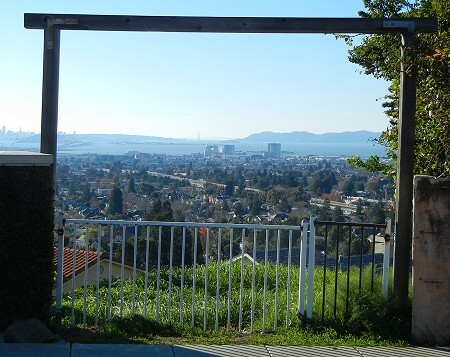 We’re finally going back down in to the bowl of Rockridge Boulevard, so you can see now what those high homes have for viewsstraight out the Golden Gate. The good burghers who settled this area a century ago would take these steps to catch the streetcar to their jobs across the bay. 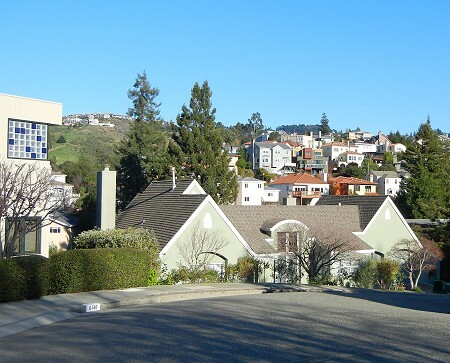 Here’s the view of Claremont Canyon from Broadway and Keith. 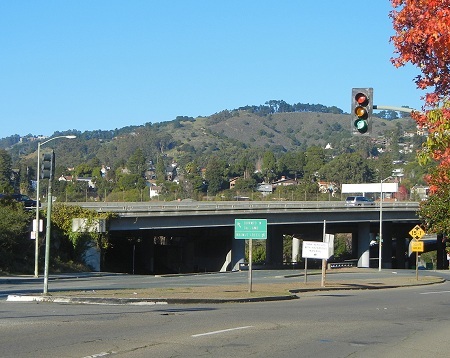 The white bit by the traffic light is the tower of the Claremont Resort. 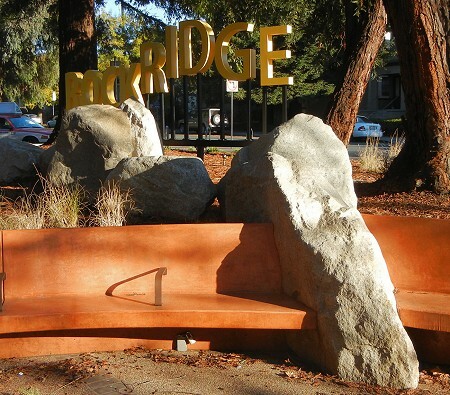 The nearer ridge is just in Berkeley across the valley of Temescal Creek. And from here it’s a straight walk down to the refreshments of College Avenue. There are bits of bedrock along the upper part of Keith, but then you’re back to the lowlands. 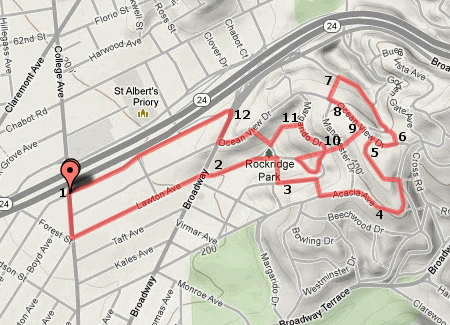 This entry was posted on 27 January 2013 at 9:55 pm and is filed under Oakland geology views, Oakland geology walks. You can follow any responses to this entry through the RSS 2.0 feed. You can skip to the end and leave a response. Pinging is currently not allowed. Great stuff. It might be the limitations of the blog tool, but I’d like to see enlarged versions of the pictures when you click on them.